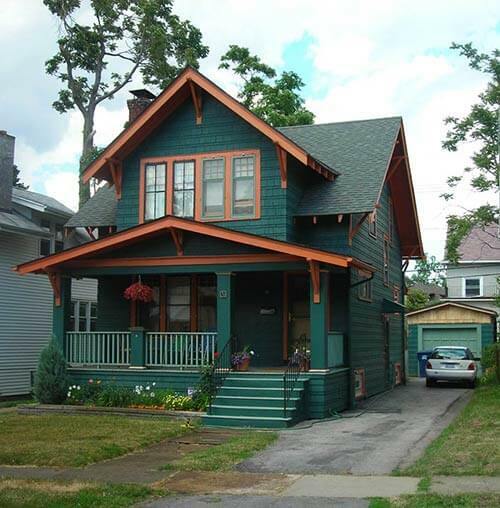 Readers Cathy and Dave have been slowly renovating their 1914 Arts and Crafts Bungalow in Buffalo, New York, over the last several years, trying to undo years of neglect, poorly executed “fixes” and adding modern day conveniences (like having more than one countertop outlet in the kitchen). 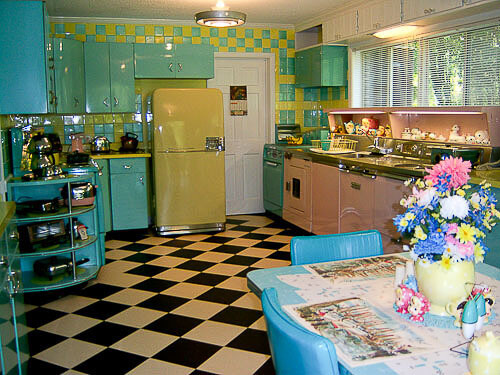 Initially drawn to Retro Renovation through their research on VCT flooring, they found a wealth of other helpful information and sources for their vintage kitchen remodel. Initially intimidated by installing VCT flooring, they realized it wasn’t that difficult and are extremely happy with how their flooring — and kitchen as a whole — came together. Continue reading to get all the details… and to see 9 more photos. 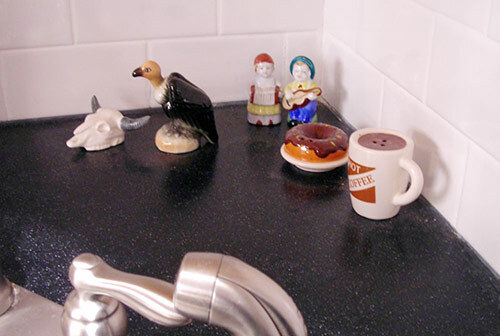 Special thanks to photographer Biff Henrich of imgink.com for permission to use the lovely “after” photo — what a charming kitchen! Our house is older than mid-century (a 1914 Arts and Crafts bungalow), but Retro Renovation has been a great resource for us. When we bought the house nearly 16 years ago, it was definitely a “fixer-upper” but it had good essentials — including a front porch, nice woodwork (hidden under layers of paint) a back deck, and working fireplace. Alas, the kitchen wasn’t one of the selling points. 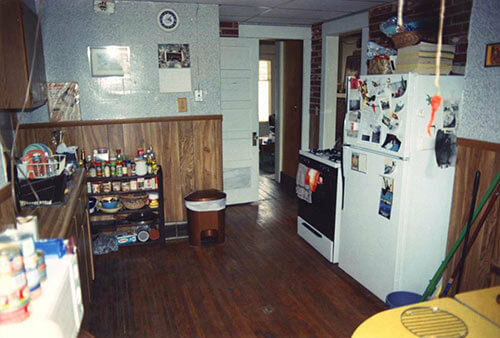 It had a poor layout, almost no counter space, particleboard cabinets, and a wacky assortment of cheap wall treatments – fake brick, contact paper, and cheesy paneling. The floor was part beat-up wood (actually a sub-floor) and part crumbling tile, and other “features” included a dropped ceiling and a single counter-top electrical outlet. Finally, the window (the only replacement window in the house) had been installed sideways so the crank was in a hard-to-reach upper corner. We made some changes to the kitchen as time went along. Slowly all of the bad wall treatments were replaced with fresh plaster, paint, and real wood wainscot. But the main features remained. After many years of researching and dreaming, we finally took the plunge and renovated last summer. We came up with the new floor plan ourselves, ultimately fine tuning details with the advice of our contractor and the cabinet salesman. How It Worked: We had a contractor do the demolition, as well as electrical; plumbing; and installation of the subfloor, cabinets, countertop, and window. We did the wall painting and installed the floor and wall tile ourselves. Dave built the framing around the window (inside and out) and built the interior trim and extended the wainscoting using materials from Home Depot, Lowe’s, etc. We’d like to add a ‘thank you’ to our contractors — Jeff Ingersoll and his staff at Ingersoll Painting and Construction — and to George Siwy at Artisan Kitchens and Baths for their expert help. Kitchen floor: We chose Armstrong Excelon VCT… decided in part by reading this blog. (Salespeople tried to talk us into other options, like sheet vinyl-but they just didn’t look as good.) After installation, we emailed Armstrong to ask about recommended cleaning products, they responded very promptly. It’s worked out fine, and we really enjoy the look. For anyone considering VCT, don’t be scared by those who say that it’s hard to install and maintain — it’s not! 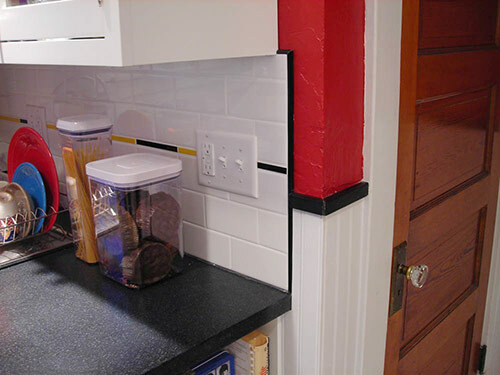 Kitchen backsplash tile: We used American Olean white ceramic subway tile in white. (The yellow pencil-trim tile had to be custom made, so we had to wait about 6 weeks for them.) This was our first tile installation project, and it was really fun! 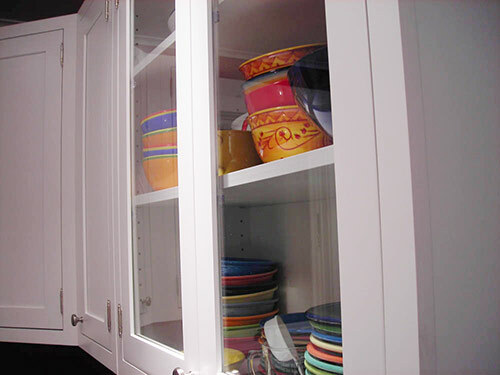 Kitchen cabinet: The cabinets were made by Medallion Cabinetry and purchased through a local kitchen design firm. These were the most expensive item, but worth every penny. We splurged on pull-out drawers for pots and pans and a narrow cabinet for baking sheets & cutting boards. We really wanted the inset doors, and that automatically bumped up the price. We saved a bit of money on the glass panel cabinet by purchasing and installing the glass ourselves. 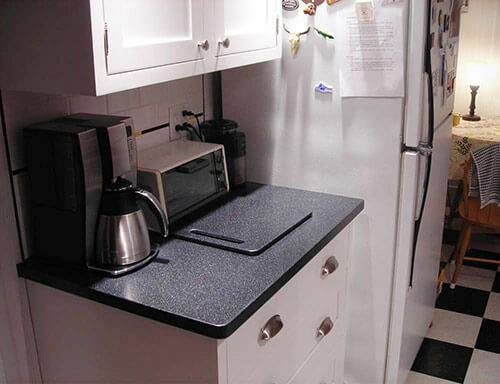 Kitchen countertops: Staron (similar to Corian) in Sanded Onyx. We wanted a dark color to create a more definitive horizontal line in the kitchen. We love the look, but it does require more everyday cleaning and maintenance, as water spots and spills are very visible. Kitchen lighting: We bought a schoolhouse-style fixture from Rejuvenation catalog, augmented by ceiling canister lights. 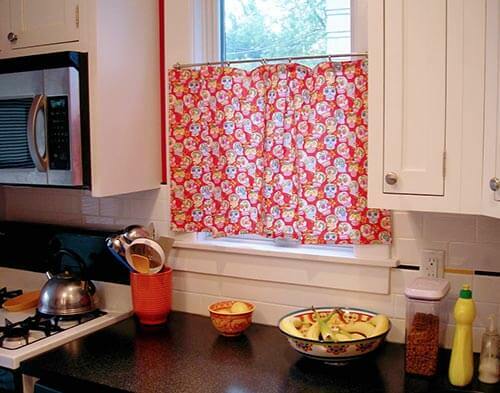 Kitchen window treatments: Cafe curtain rod from Rejuvenation. 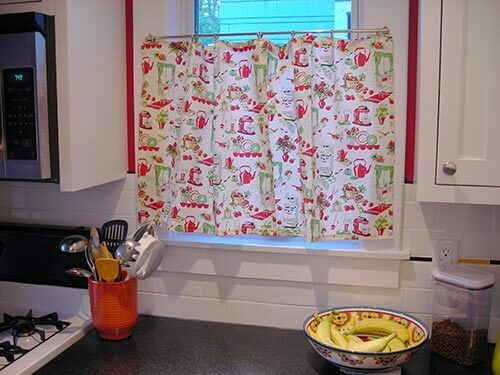 Dave’s sister kindly sewed curtain panels using Michael Miller fabric (discovered via Retro Renovation). Currently (photo below) we’re using Day-of-the-Dead curtains (fabric from mexicansugarskull.com). 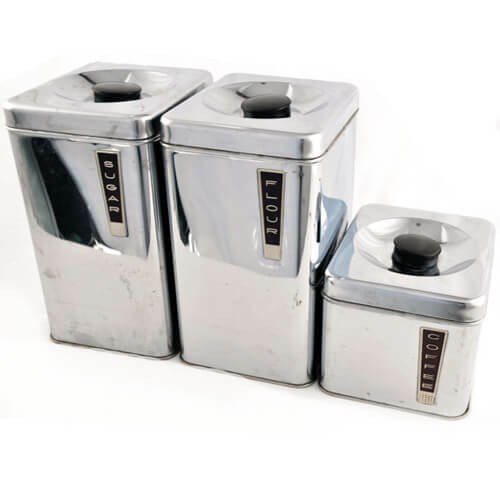 Appliances: To stay within budget, we’ve kept our current stove and refrigerator for now. But we added a dishwasher (a luxury!) and replaced our sink and microwave. Maybe someday — a cool red fridge made by Big Chill! Challenges: The electrician had some difficulty with metal-lath walls and plumbing in the ceiling, forcing unplanned relocation of lights and outlets. Overall: It came out the way we’d hoped – we wanted the kitchen to fit the design of our bungalow. We didn’t increase the size of the room, but our storage capacity, lighting, and working space are so much better. 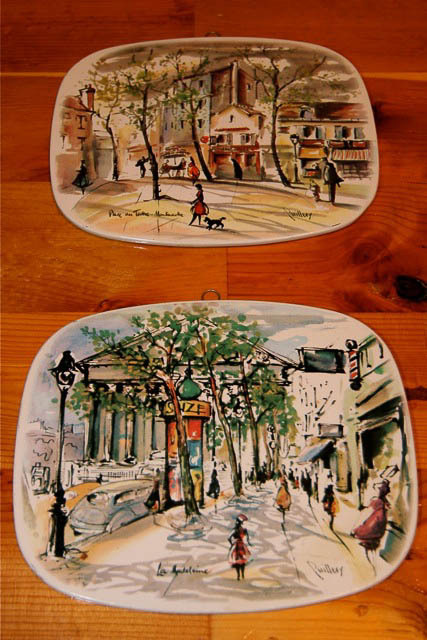 We love walking into our cheerful kitchen now! 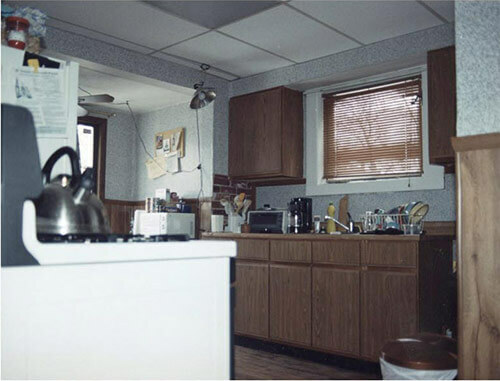 As you can see from the “before and after,” we were able to make a pretty significant change on a reasonable budget, and it’s a great feeling to walk into our cheery kitchen every morning. Cathy and Dave’s vintage kitchen remodel hits very close to home for me, since I did a very similar gut remodel to the kitchen in my first house — an 1890 Colonial Revival — with some of the same problems (especially in the kitchen) that they faced in their 1914 bungalow. It is wonderful to see other homeowners tackling such a big job — and getting such great results. With a vision, some creativity and lots of hard work — it is possible to have the vintage kitchen of your dreams. Thanks so much for sharing your kitchen transformation with us, Cathy and Dave. Give yourselves a pat on the back for a job well done. 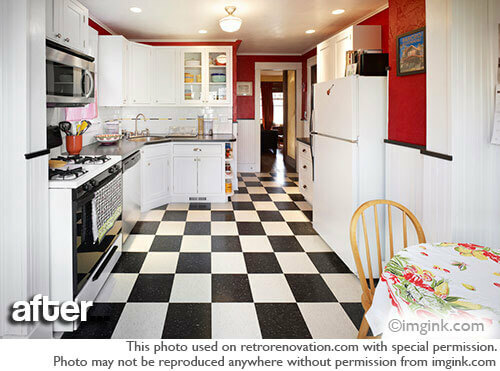 See more stories about Kitchens with Checkerboard Floors here. Bungalow’s are the best home s- I know, ‘cuz I live in one. This is super! Way to go, you ywo!! We just bought a condo in Chicago and wish to sell the Big Chill refrigerator and dish washer that are in it. I hate to just go on Craigs List. Any ideas? Thanks. I was seeking a way to wholesale it to a dealer but I’ll try listing it there as well.